The NEW "quick disconnect" large SCT thread two-piece adapter allows the DL2006 Focuser to be quickly removed and installed on a telescope simply by loosening three thumbscrews. Slightly loosening the three thumbscrews permits the user to rotate the entire DL2006 Focuser. 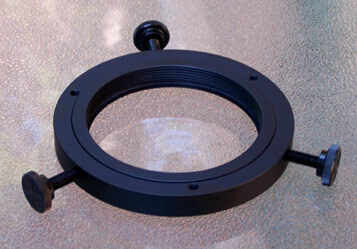 The connection between focuser and telescope is extremely rigid due to the large 4-inch diameter flange. The three ¼” thumbscrews provides an extra tight connection and do not interfere with rotation when tightened [compared to other methods that tighten with a large ring and can inadvertently rotate the focuser when tightening]. This adapter fits both the Meade and Celestron Large SCT Thread [3.2x-16 tpi] rear boss. The picture above shows both pieces of the "quick disconnect" large SCT adapter mated. The adapter is only ½” thick and takes up an insignificant one-tenth of one inch of backfocus. The DL2006 Focuser top with the large SCT mounting adapter sits only 1.1 inches behind the threaded boss at minimum travel. This low profile means less cantilevered overhang of heavy accessories for more rigidity. There is room for the flip mirror that had to be abandoned when using other tall, high profile focusers. Also with Schmidt-Cassegrain telescopes there is an optimal focal point, determined by the secondary-primary separation, where optical aberrations are minimal. The focal point where aberrations are minimal is typically close in to the threaded boss. The ultra-low profile of the DL2006 with large SCT mounting adapter usually permits focusing at the optimal close-in focal point for minimum aberrations. This is particularly important for optimizing CCD Camera capabilities. The picture above left shows a 3.2x-16tpi threaded boss typically found on the rear of large Meade and Celestron Schmidt-Cassegrain telescopes. The picture above right shows the threaded flange of the large SCT adapter screwed onto the 3.2x-16tpi threaded boss. The picture above left is a bottom view of the focuser ring of the large SCT mounting adapter bolted to the DL2006 Focuser. Note the 2” clear aperture through. The DL2006 focuser has three built-in elliptically tipped setscrews in the focuser base for aligning the focuser mechanical axis with the telescope optical axis. When aligned with the large SCT adapter, the focuser will stay aligned when the focuser is rotated or when removed from the telescope. The picture on the above right shows a DL2006 focuser with large SCT thread adapter mounted on a telescope with the 3.2x-16tpi threaded boss.